Dr. Hoffman’s medical practice is the embodiment of Intelligent Medicine. Conveniently located near Columbus Circle on the West Side of Manhattan, it’s a virtual living laboratory for the healing principles set forth in Dr. Hoffman’s radio show, podcasts, articles, lectures and books. For over 30 years, patients with a wide gamut of challenging medical problems have achieved remarkable recoveries using the best of natural medicine, judiciously combined with high-tech innovations. Breakthroughs are often achieved even after patients have consulted a myriad of mainstream specialists and holistic practitioners. Key modalities include lifestyle modification, customized diets, detoxification, oral and intravenous supplementation, and custom-compounded bio-identical hormones. Dr. Ronald Hoffman is recognized as one of America’s foremost complementary medicine practitioners. He is founder and Medical Director of the Hoffman Center in New York City, author of numerous books and articles for the public and for health professionals, and is host of the popular nationally-syndicated radio program Intelligent Medicine, and the Internet podcast of the same name. He is active in several medical professional organizations, and is a past President of the country’s largest organization of complementary and alternative doctors, the American College for Advancement in Medicine (ACAM). He is a frequent guest on radio and TV, and is frequently quoted in popular magazines and newspapers. He is also called upon to lecture both to the public and to groups of medical professionals. On the personal side, his active lifestyle is an embodiment of the healthy principles he espouses. Dr. Hoffman received his Bachelor’s Degree from Columbia College and his M.D. from Albert Einstein College of Medicine. He was trained in Internal Medicine at the Manhattan V.A. Hospital. He subsequently attended the Tristate School of Traditional Chinese Medicine and obtained New York State certification to perform acupuncture. He is a Fellow of the American College for Advancement in Medicine and the American Academy of Environmental Medicine, and is a Certified Nutrition Specialist of the American College of Nutrition (ACN). Dr. Hoffman is one of the pioneers of complementary and alternative medicine. In 1985, he established the Hoffman Center as one of New York’s first comprehensive practices for the delivery of innovative medical care. As Medical Director of the Hoffman Center, Dr. Hoffman maintains a busy practice seeing patients and supervising the therapies administered by the team of health professionals he has selected and trained. Based on years of clinical experience and intimate familiarity with vitamins and herbal preparations, he has designed a line of nutritional supplements for Hoffman Center patients, now available to consumers. Since 1988, Dr. Hoffman has been host of Intelligent Medicine, the longest-running physician-hosted medical talk show on the air, heard Saturdays on the WOR Radio in New York and in syndication across the country. Topics run the gamut from innovations in high-tech medicine, to diet, supplements, lifestyle and exercise. Dr. Hoffman’s entertaining format has gained a wide listener following, blending interviews, features, and audience Q & A.
Dr. Hoffman is a popular lecturer to the public. He has spoken to the Alumni Association of Albert Einstein College of Medicine and to New York and New Jersey Hadassah groups. He hosted the annual WOR Health and Lifestyle Expo drawing hundreds of listeners from the Tri-State area. He has taught courses for the Learning Annex and the New York Botanical Gardens and has addressed the United Nations Council on the Health of Women and Children. Dr. Hoffman also lectures to health professionals. He has presented at workshops and in the general session at the American College for Advancement of Medicine (ACAM) and for the American Association for Anti-Aging Medicine (A4M), and was a featured speaker at Expo West. He has been a guest lecturer to medical students at the Albert Einstein College of Medicine and at Cornell Medical School. He has offered talks for Continuing Medical Education credit to doctors at the Westchester County Medical Society and at the Lyons Veteran’s Administration Hospital in New Jersey. Dr. Hoffman is active in several professional organizations and is a prominent advocate for the Intelligent Medicine approach to patient care. He is a past President of the American College for Advancement in Medicine (ACAM), and former Program Director. He served on ACAM’s Board for 18 years. He is a past board member of the Certifying Board of Nutritional Specialists, and serves on the editorial board of the Alternative Medicine Review. His efforts to support alternative medicine education have led to the establishment of the Ronald Hoffman Summer Scholarship Fund for students researching complementary approaches at Albert Einstein. Dr. Hoffman has served as national spokesperson for the highly successful radio advertising campaigns of Propax with NT Factor, Ester-C, Ginsana, and Garlique brand garlic, and he has garnered numerous sponsors for his radio show. He has recently completed a collaboration with the Vitamin Shoppe to develop a condition-specific MD Select line of nutritional supplements. His endorsements are highly sought after because of the trust he commands among consumers and health practitioners alike. 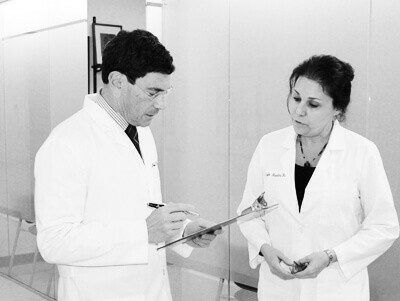 Dr. Hoffman was raised in Southern California, and came to New York City to attend Columbia College. He has remained a New Yorker ever since. He now divides his time between homes in Manhattan and Hampton Bays, Long Island.